In 2015, Horwath HTL recorded a total of 335 hotels and more than 40,000 rooms in operation ranging from luxury to economy. It is understood that a further 12 hotels opened in the first 9 months of 2016 or an additional 1,600 rooms. 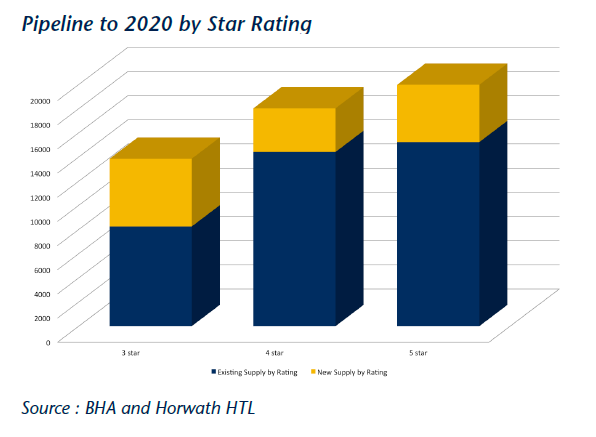 Within our database another 74 hotels are expected to open between 2017 and 2020 representing a 20% increase over current hotel stock. Our figures are believed to be conservative with other secondary sources indicating inventory increases of around 25%. 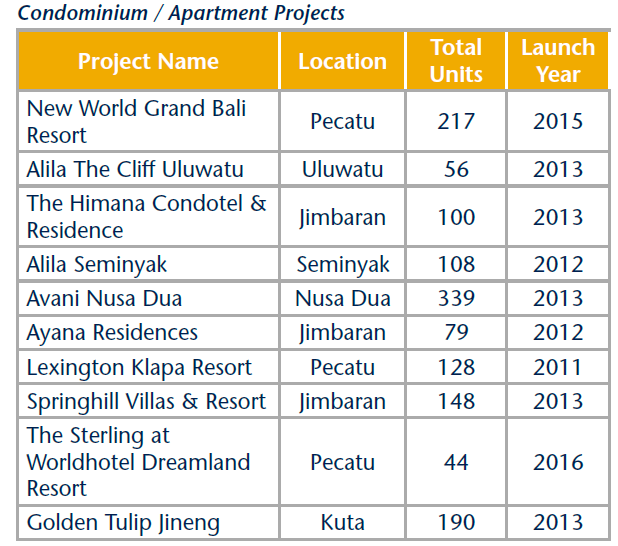 West Bali (Kuta, Tuban, Legian, Seminyak, Canggu, Tanah Lot and Tabanan) remain the preferred development spot with around 50% of the total new supply expected within these areas. Inventory in Central Bali is expected to increase by around 24% by 2020 adding more pressure to a weakening Ubud market performance. Ubud is transforming from an area known for its luxury and tranquillity into a busy yoga, healthy living, food & beverage entertainment zone with accommodations matching every price point and an access road that is well past its prime. As new midscale properties open in Ubud we expect that the areas average rate will continue to adjust to its new dynamic. We have no new developments on file for North Bali although the rumoured new airport development near Singaraja will likely change this should it come to fruition. The 2017 to 2020 pipeline is dominated by 3 star products representing about 38% of total new supply and more than 5,600 rooms across Bali. Less investment cost with a typically faster return period appear the safest option for investors at the moment. Shifting market dynamics should play well for this segment although the existing plethora of options and very low rates should raise concerns about the potential returns for this segment. As mentioned above, a 2016 survey conducted by Bank Indonesia (BI) shows that the average daily spend of tourists fell a disturbing 34% from USD 190 to USD 126 between 2014 and 2015. On top of that, average length of stay over the same period also dropped 6% from 8.19 days to 7.66 days per stay. The same survey shows that among the top 5 Bali source markets, Australia is the highest spender (almost 4 times higher than China) with typically much longer ALOS. In other words, 1 Australian tourist spends the same per day as 4 Chinese tourists. When the government focuses on increasing the number of visitor arrivals, it makes sense to aggressively campaign Mainland China because it is only a short to medium haul from Indonesia with increasing direct flights and a very large population giving it the greatest potential for growth. It is essential however to foster other markets simultaneously to balance quantity and quality of foreign arrivals. The Thai experience is one to learn from, having aggressively targeted arrivals growth over the last decade they have now shifted focus to increasing yield per tourist. Last year, island resort-grade real estate faced volatility in both pricing and absorption rate, with developers softening sales prices to secure transaction volume in a time of economic recovery. Nevertheless, a positive outlook for hotel residences is expected as new developments are branching out from the midscale and upscale segments into new products which are being priced at lower entry points. In light of the current economic situation and an oversupply of three and four star hotels, properties have been facing tighter profit margins which has in turn affected the sales of residences in the segment. Since unit owners of these properties typically invest in financial returns, hotel performance is essential to entice new buyers. Although investors have previously benefitted from guaranteed yields, the sector is now facing volatility from the developer’s side as operators are finding it harder to deliver the promised yield. That said, the market is seeing more rebranding within the past few years, with operator changes now becoming more commonplace. Another trend is that new developments are shifting their sales strategy to limiting commitments to purchasers by lowering sales prices and eliminating guaranteed yields. Similarly, some notable recently launched projects are moving towards the luxury segment, as developers expect demand to be less susceptible to an economic downturn. This is reflected in some of the newer project offerings including the Residences at Mandarin Oriental, The Sterling at Worldhotel Dreamland Resort and Bali National Golf Villas which will be managed by Shangri-La Hotels & Resorts. Viewing the macro real estate market, one of the highest level issues in 2016 that is extending into this year is the Indonesia’s tax amnesty program. This has gained widespread adoption from domestic businesses and high net worth individuals. While it has created a certain level of short term pain in terms of liquidity, on the flip side it is unleashing new investment into the property sector. Moving into the overseas buying market the amnesty has created a larger degree of uncertainly with foreign owners, especially in Bali’s significantly nominee segment. It’s still too early to see the impact this will have on units as they come into the resale market under this type of structure but presently sentiment remains mixed. One final trend seen during last year had been in a rising number of land transactions, most notably in South Bali. Pricing levels on a broad basis peaked in 2014/2015, and this year sellers have been trading property at off peak levels of 10-25%, which is moving the market towards more rationale values and should spur new development opportunities. 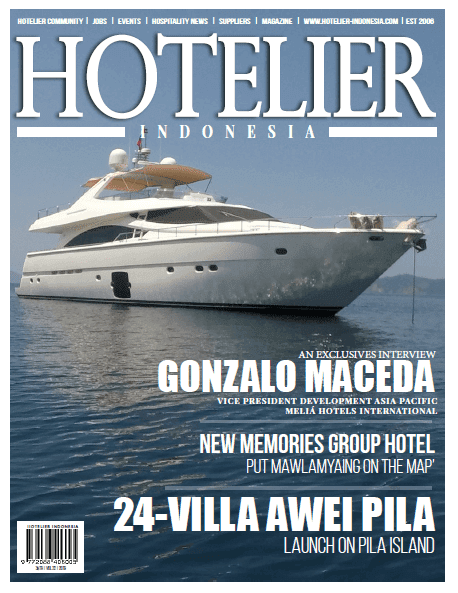 Buyers of hotel residences are mainly Indonesian investors for all product tiers. However, we have noted a preferences for properties yielding high investment returns in the mid to upscale segments, whereas the presence of lifestyle investment is more prevalent in ultra-luxury products such as the Bvlgari Residences. Presently, a large number of project marketing and sales offices are based in Jakarta and Surabaya with limited promotion outside the country. The lack of international exposure coupled with complex foreign ownership issues has continued to be an inhibitor to broader overseas buyers. Nevertheless, recent destination exposure of Bali towards Chinese tourists through media channels and direct traffic has increased interest for all real estate segments. Sales of multiple units per transaction in the midscale segment and single property buyers in the luxury segment are rising. While the current government has talked about wider reforms in foreign property ownership, this remains a talking point with no firm legislation yet. Carrying forward from 2015, a new regulation which was expected to ease restrictions on foreign ownership of properties in Bali has left little impact in attracting new investment as the revised law only grants legal foreign residents the “right of use” (Hak Pakai) for a maximum of 80 years. The practical application of this has not gained widespread acceptance. Furthermore, the value must exceed IDR 2 billion for apartments and IDR 3 billion for landed houses, whereby management of Hak Pakai properties face many restrictions on rentals as owners must transfer the rights to another party should they leave the country for more than one year. 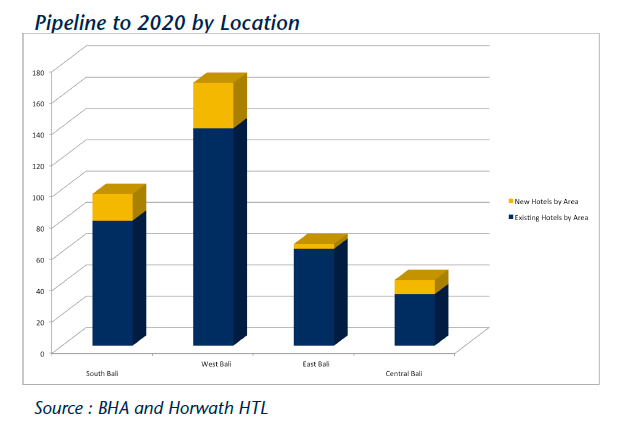 Additionally, developers mainly target domestic buyers due to their bigger market size. Thus, most projects are registered under “right to own” (Hak Malik) which are eligible for Indonesians only. Therefore, foreign buyers with no residency are still pushed towards a general lease agreement, nominee agreement, or a PMA (Penanaman Modal Asing) model, which allows ownership of properties under a company’s name and is subject to tax. Overall the average built-up sales price market-wide dropped by 6% in 2016 to USD4,446 per square meter, while the sales absorption rate picked up to 3.17 units sold per month compared to last year’s average of 2.46. 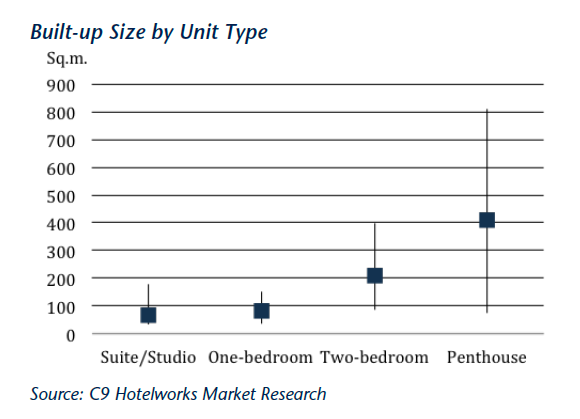 One-bedroom units are the most popular configuration. Currently the market is experiencing a price drop and strong push in volume sales due to soft economic conditions. Developers are now dropping unit prices in exchange for no guaranteed yields, with new projects such as The Sterling at Worldhotel Dreamland Resort and Springhill Villas & Resorts adopting this practice. This strategy is resonating with both developers and investors, whereby putting less pressure on operators and allowing buyers to obtain a lower pricing point. Another factor contributing to a decrease in the average market price is the sellout of some legacy developments. While supply remains dominated by midscale and upscale segments with new projects entering the lower pricing tier, the rising popularity in two-bedroom units is notable. 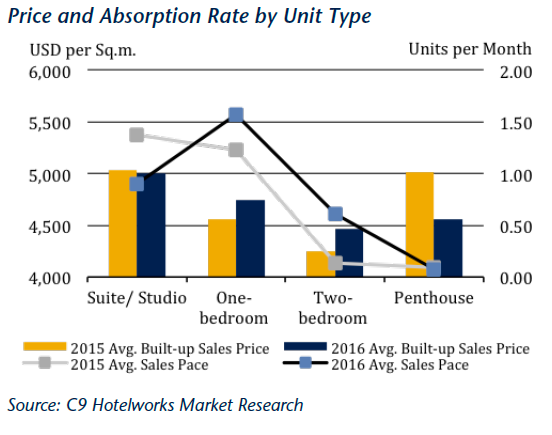 However, one-bedroom units remain the most popular with an absorption rate averaging 1.57 units per month. This is also reflected in increases of built-up sales price for both room types, whereas penthouses have seen a 9% decrease from last year and have the lowest absorption rate in 2016. 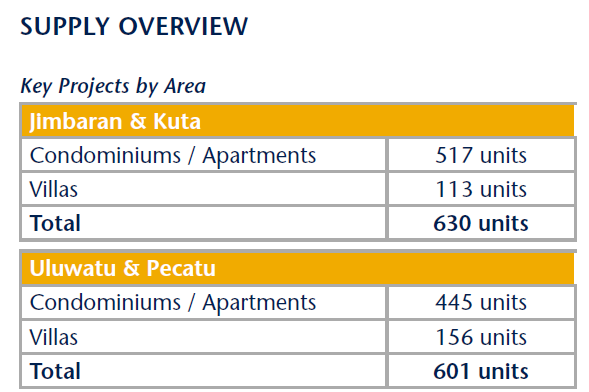 Units priced under USD300,000 increased 18% in supply compared to the previous year. 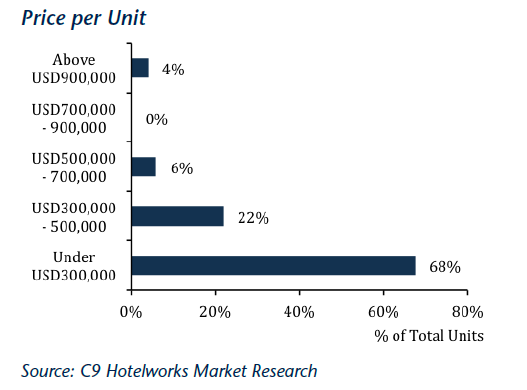 Suites and studio units have the largest inventory, representing 69% of total supply. 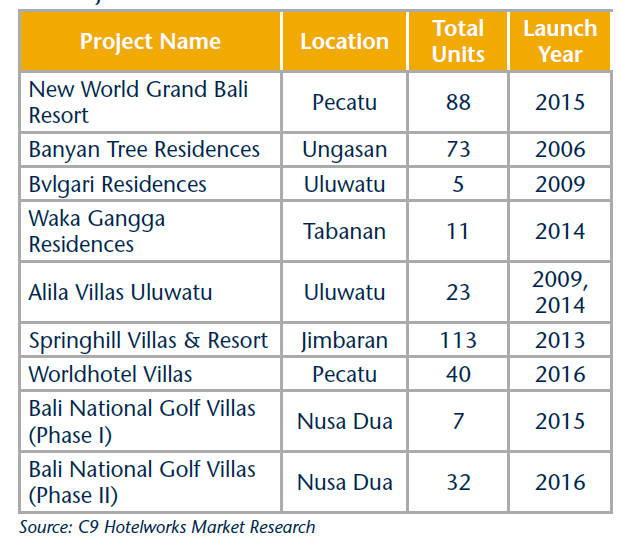 Bukit Pandawa is expected to become a major competitor of Nusa Dua as an integrated resort, which will feature the Residences at Mandarin Oriental and other international brands. 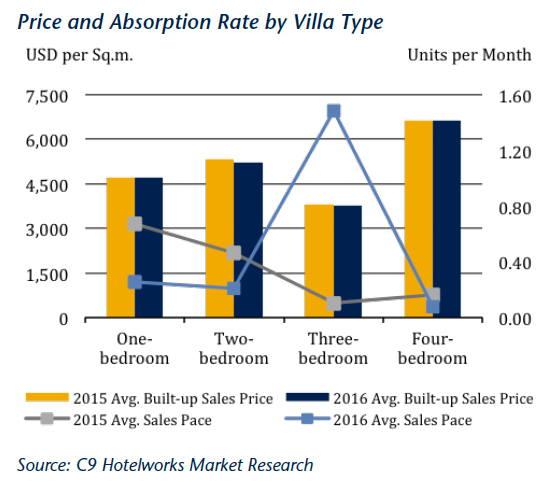 The average built-up sales price for villas is USD4,314 per square meter in 2016, which is lower than that of hotel condominiums/apartments. The 13% y-o-y drop has been driven by a reduction in prices of launched projects as a consequence of a slowdown in sales. There has also been some project cancellations in this tier. As a result of lower prices, the overall sales absorption rate is rising with transactions broadly averaging 1.95 villas per month compared to 1.02 last year. The increased pace has been stimulated by three-bedroom villas, which has reversed its position in 2016 to become the fastest selling configuration. More products priced above USD 2 million are expected as pipeline projects edge upward. 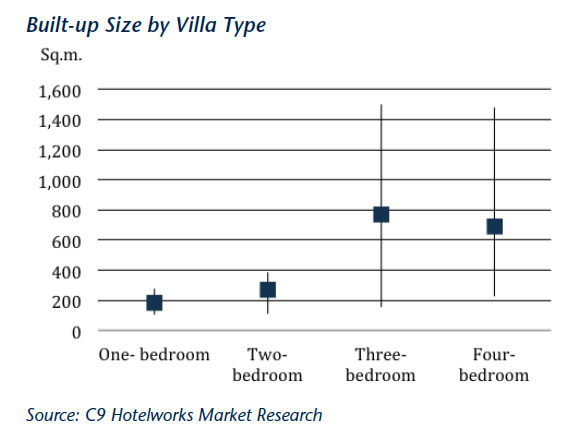 The built-up size of three-bedroom villas has the highest increase compared to last year, with an average of 37% additional built-up area. 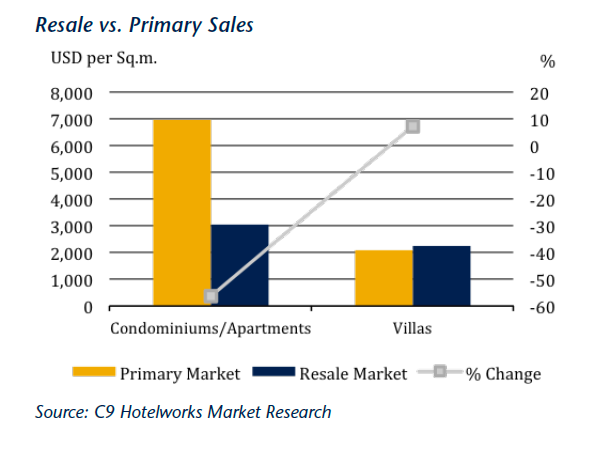 Average built-up sales prices in the resale market are 32% lower for condominium/apartment units and 7% higher for villas when compared to the primary segment. 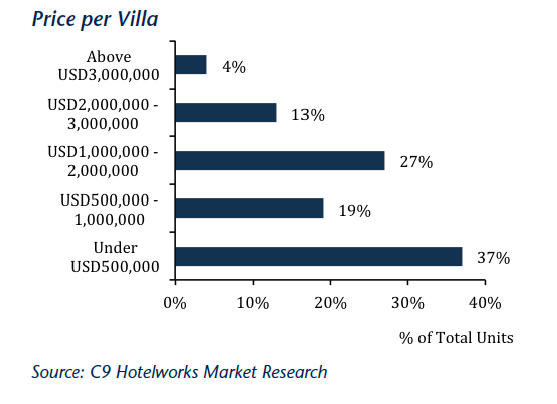 Currently, the majority of resale hotel residences are in three and four star properties, with condominiums/apartments and villas resale markets averaging USD3,045 and USD2,235 per square meter, respectively. inventory available in the resale market is substantially lower than that of condominium/apartment units because owners typically invest for lifestyle purposes, especially for luxury properties and typically hold for longer periods. On the other hand, condominium/apartment units have more frequent transactions in the resale market but at a significant discount. A number of units currently in the market have leasehold terms ranging between 26 and 80 years, whereby the discount also ranges according to the remaining years in the original leasehold period. Price reductions for units in the last 30 years of tenure can be as high as 78% off the original sales price, whereas units with longer leasehold years remaining have rates discounted from 27% to 56%. Viewing the performance of condominium/apartment units and villas in the resale market, the former type is lucrative for short to mid-term investment as they require less capital to purchase and can produce an equal ROI to villa projects, whereas the latter is more favorable for long term investment as buyers often benefit from capital gains of a property sale. With the global economy remaining volatile, the market for hotel residences is expected to follow suit. 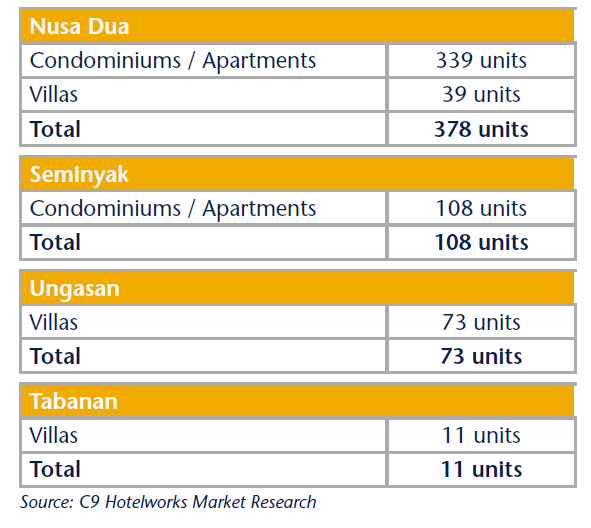 However, we forecast greater traction for condominium/apartment projects as opposed to villas due to their lower ultimate pricing point. Because condominium/apartment developments have lower capital values and are easy for hotel operators to generate income from hotel operations, the structure is more suitable for investment purposes. We are also seeing a growing demand in the lifestyle investment sector as new villa developments are escalating towards the luxury segment. Looking into to the future, if the plan for a new airport in Singaraja and four toll roads to connect North and South Bali materialize a new market cycle will ensue. 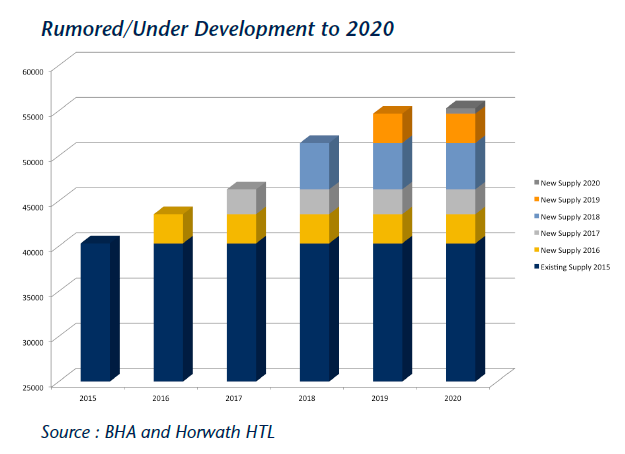 The capacity to tap tourism will push more developments of hotel residences into areas outside South Bali and the creation of a new broader real estate markets which have significantly lower underlying land cost basis.